Heads reared above sturdily balanced hind legs, two stallions engage in combat. Territory is being disputed. Made Mudana sculpts their forms to refined perfection as he hand-carves the statuette from richly grained suar wood. He carefully marks every muscular contour. Mudana's expert eye for detail results in a highly expressive piece that exudes the fierce force of battle. 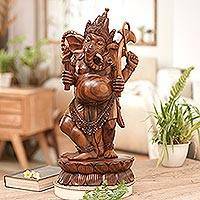 This item is individually carved by hand and belongs to a special collection created by the artist. 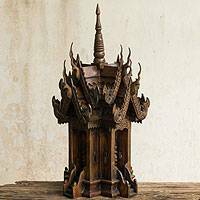 Pirot Gitikoon shares Thai traditions with this hand-carved replica of a Buddhist temple, intended as a guardian spirit house or san phra poom. According to custom, when people finish building a house they include a spirit house to protect the family from evil spirits. Gitikoon carves this house by hand from quality teak wood. The gables feature eight heads shaped like Naga, the protective dragon. The bargeboards replicate Naga's scales, as well as swan tails. The swan is a mystical being from the Himaphan forest. A small pagoda adorns the rooftop; it is crowned with a lotus blossom. Suar wood boasts a rich, polished tone, accentuating the reverent aspect of this statuette, patiently carved by the hands of Wayan Rendah. Ganesha, the sacred man-elephant, stands atop a supportive lotus bloom. The son of Siwa and Durga, he is said to be able to keep under control the occult forces that bring disaster upon humankind. His clothing and posture evoke a sense of nobility, while his expression bespeaks kindness and generosity. Four arms hold varied symbols of Hinduism, such as the chain (the eternal quality of knowledge), the lontar palm book (the source of accumulated knowledge), and an axe and a lash, which protect the world from evil. 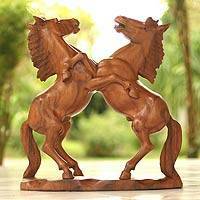 This item is individually carved by hand and belongs to a special collection created by the artist.